Environmental non-profit Cool Effect set out to raise awareness of its new digital platform at SXSW. Cool Effect, a San Francisco-based nonprofit organization dedicated to combating global warming, set out to gain credibility and supporters by asking South by Southwest attendees, "What on Earth do you want to save?" The idea of Cool Effect was first introduced to the world at the Sustainability Innovation Forum during COP21 in Paris. Cool Effect is designed to unite people through a digital platform which allows individuals to directly fund projects geared towards reducing carbon pollution in the atmosphere. Each project featured on the organization’s website has been reviewed by a team of world-class scientists who work to ensure credibility and help verify carbon reduction. The #LetsSave campaign was motivated by the organization’s desire to break through the clutter in the crowded city of Austin during SXSW, while also raising awareness of Cool Effect's new digital platform. Cool Effect chose Austin and the SXSW Interactive portion of the festival, which took place from March 10-15, to be a launch pad for the brand to release the beta version of the Cool Effect platform and begin building a community of supporters. Demonstrate PR aided Cool Effect with this campaign. The primary goals for this campaign were to "build brand history" and credibility with the beta launch, while building a community of like-minded individuals that are ready to take action against climate change, explained Demonstrate PR CEO Joey Hodges. "Cool Effect, in its simplest form, is a destination designed to unite people with the common goal to fight global warming," Hodges said. "Through a mix of earned, experiential, owned, and paid media we were able to effectively target the alarmed and concerned individuals that are anxious to take action." The overall strategy of the campaign was to have multiple touch points around Austin during SXSW Interactive to reach different influential key audiences, both with physical and digital elements of the campaign. There were two main components to the campaign - a news announcement targeting media outlets to cover the beta launch and the SXSW activation aimed at getting attendees to join the cause. Before touching down in Austin, Cool Effect had a goal of acquiring 2,000 new members that were interested in learning more about the cause. On March 10, a press release was issued by Cool Effect announcing the release of the beta platform. Prior to announcement, target media outlets were pitched with embargoed information and interviews with brand spokespeople were arranged. Targeted environment publications, such as FastCo.Exist, Grist, Ecosystems Marketplace, and Huffington Post Eco, covered the beta launch news. On March 11, Cool Effect hit the streets of Austin with a 30-person street team, 10 eco-friendly vehicles, and a branded glass truck to invite people in the area to answer the question, "What on Earth do you want to save?" If passersby engaged with brand ambassadors to learn more about Cool Effect, they were given a bracelet that would grant them complimentary rides around Austin (March 11-15) in the branded fleet. The same question was asked in a branded photo booth on a Cool Effect glass truck. People could type in something they were personally passionate about saving -- from the Swiss Alps to kindness -- and take a photo. After personalizing the message, users chose from a variety of eco-centric backgrounds including the beach, ocean, and a glacier with a polar bear. Photo booth goers were encouraged to share their experience across all social platforms using the hashtag #LetsSave. One photo booth highlight was when model Brooklyn Decker stopped by the truck to take a photo and share what she wanted to save via Twitter. On March 12, Cool Effect was a sponsor at an unofficial SXSW dinner hosted by young entrepreneurs at a local lumber mill. Cool Effect set up the photo booth at the dinner. The following day, Cool Effect sponsored the TechStyle Lounge at SXSW. Cool Effect COO, Marisa de Belloy, was on a panel among other innovative brands. 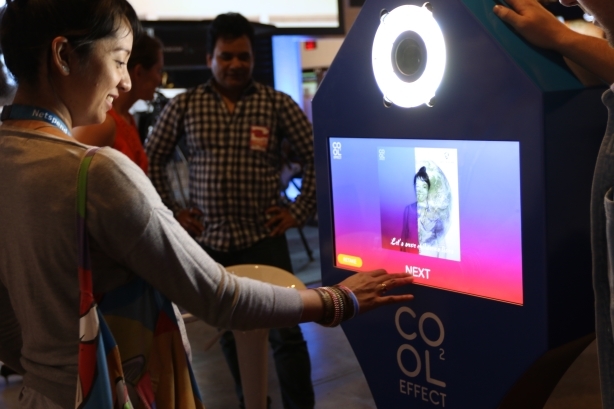 On March 14-15, Cool Effect was an official SXSW sponsor at the SXgood Hub hosted by SXSW Eco. The goal at SXgood Hub was for the brand to gain visibility among other social good companies and engage with attendees coming through the event. The #LetsSave campaign enabled Cool Effect to acquire 8,000 new community members – far surpassing its goal of gaining 2,000. Cool Effect also garnered more than 404 million earned media impressions with campaign efforts. The organization also received over 30 media placements. Top coverage included: ABC News, Fast Company, Grist, Earth Talk, People, The Huffington Post, Just Jared, Hollywood Life, OK!, and Yahoo. The #LetsSave campaign reached over 13 million impressions via social and digital media and achieved a 91% positive sentiment from Facebook, Twitter, and Instagram. In addition, Cool Effect social media community increased by 816%, with over 199,000 engagements across Facebook, Twitter, and Instagram.